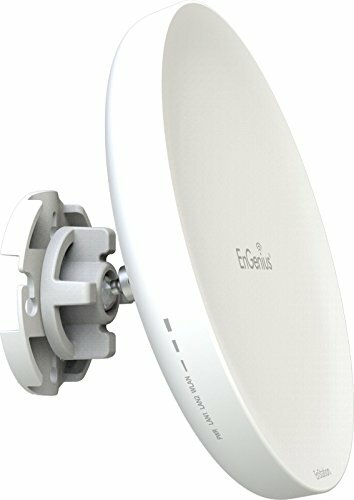 Ingenious Entomb EnStation5-AC enhanced Outdoor 11ac Wave 2, Wireless AC867 Client Bridge/AP delivers high bandwidth over extended distances with reduced interference for point-to- point or point-to- multipoint connectivity. Powerful onboard quad-core processors combine with new 11ac technology to maximize speed and support greater device capacity and connection reliability. EnStation5-AC delivers next generation, business-class Wi-Fi at exceptional pricing. EnStation5-AC extends the wireless network across large campuses, over vast acreage in parks and recreational facilities, parking lots, city blocks, and industrial, farming and ranching properties; in sizeable indoor structures like arenas, shopping malls, warehouses and convention centers and in other challenging settings. Quad-Core CPU, 4x ARM Cortex A7 Processor, 717 MHz "Turbo Engine"